My love of detail has often made me a person who makes things more complicated than they need to be. I first learned this about myself at age 14 during a Summer Theater Workshop. We each had to pantomime an activity and the rest of the workshop would have to guess what we were doing. I carefully went about getting myself a glass from the cupboard, opening a bottle and pouring myself a soda. No one, absolutely no one had a clue what I was doing. The instructor told me I was making too many little motions that were not precise enough for people to recognize. Once I got over my embarrassment and realized what I must have looked like to the rest of the group, it kind of struck me funny. You could have knocked me over with a feather. But at least I learned there is an easy way to cook a pumpkin. I’ve always loved winter squash, any kind with very hard skin, ever since I was a little girl. You’d think once I had learned Terry’s technique, I would have easily transferred that over to squash. But I had to be reminded again. I was at the bank and the teller and I were talking about how much we like spaghetti squash. “It’s kind of hard to cook, though, ” I said. (Even cutting big hard skinned squash in half can be a somewhat perilous activity for me, especially when my hands are tired and things start flying out of them.) I had read some lengthy instructions about cutting it in half, gutting out the seeds, and then rubbing it with garlic, olive oil, etc. The final complication involved covering it straight out of the oven and putting in the fridge for 20 minutes in order to facilitate perfect separation from the skin. The teller looked at me like I had said something that didn’t quite make sense. Very politely, she said, “Really? I just stab it with a knife, put it on a cookie sheet, bake it in the oven, and cut it open afterwards. Easy. ” She shrugged her shoulders and smiled. Once again, I was chastened to the point of hilarity. Thank goodness I love a good laugh at myself. My absolute favorite hard skinned squash for pie or anything else is something we call bitterroot buttercup up here. My friend Jody isn’t as big a fan as I am, so she gave me the first one from her garden. Luckily, by this time I had learned my lesson and then some. 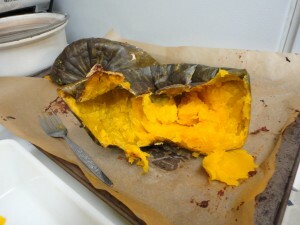 My favorite part of cooking a squash like this is standing at the stove and eating it right out of the skin. 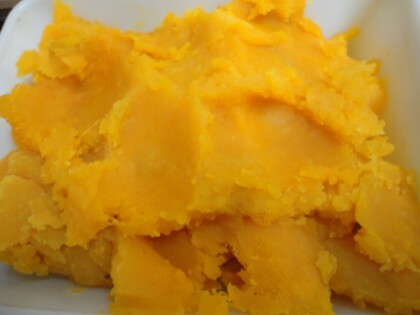 I usually only allow myself a little of that because the ” real” reason for cooking the squash is to add to soup or puree it into pie filling. So scraping the skin becomes like “licking the bowl” after mixing up a cake or cookies. But this time I decided not only would I just stab the squash and bake it, but that I would not turn it into soup or pie filling or pudding or anything else. I would just scoop it out, put it in a big dish, and add it to my simple meals all week, so I could continue to eat it the way I like it the best. Baked simply in its own skin. So without any further complications or apologies for no recipe for pie filling or soup, here is the way I cook my winter squash (or pumpkin). I forgot to take a picture of the squash before I did this, but I think that’s just as well. Because it doesn’t matter what kind it is. You can do this with any hard skinned winter squash or pumpkin. Place a silpat mat or a sheet of baking parchment on a cookie sheet. Place your winter squash on the cookie sheet. Stab it top, bottom and sides several times with the point of a sharp knife. When the oven comes to temperature, put it in and let it bake for a good hour, or until the skin dents in when you touch it with your finger, or it’s easy to poke it with the tines of a fork. Let it cool for a while on top of the stove. Take the dog for a walk or something. Come back. Cut it open. Scoop out the seeds. Scoop out the flesh with a spoon. Put some in a dish, and some in your mouth. And keep doing that all week long. Eat it plain, cold, hot, or add it to whatever else you want to eat it with, whenever you want to eat it. And if you cut it open and it’s not quite done enough, don’t despair. You haven’t blown it. Just set the halves face down on the parchment lined cookie sheet and put them back in the oven for a little while longer. They’ll keep steaming just fine. I love the Moscow-Pullman airport! Do they still have the greeter cat? I love winter squash, too. Thanks for this. I always think of it as a big pain/production, and this is a wonderful reminder it doesn’t need to be at all. Thanks, Kristin, you made me giggle. . you know, I haven’t been there in a very long time. . I don’t know if they still have the greeter cat!! Good question. 🙂 And I also smiled to read how you always think of cooking squash as a big pain/production. It’s nice to remember it doesn’t have to be that way, isn’t it? Hi Veronica, sounds like you have a really cool CSA going. I hope the “easy” way helps you develop more of a taste for squash. Once you cook it this way it can be frozen, too, or pureed further for pie, etc. Or not. 🙂 Here’s to easy being better than hard!! lol! Thank you for sharing. My mom was a terrible cook and the only fresh vegtables she made were potatoes. They were either mashed, baked, or boiled. I’ve had to learn to cook all by myself. I did not know about cooking the squash first. You just really made my life a lot easier! Welcome, Jennifer! thanks for your comment. Glad I made you laugh. And glad I made your life a lot easier! I am a squash-cooking novice and will have to try this. I live in a warmer part of the country where running the oven for an hour really heats up the house (except for, say, January and February). So I’m wondering if this technique would work with the microwave. Stab the squash with a knife then put it in the microwave for a couple of minutes then take it out and cool. This way you will be able to remove the skin easier then you can steam it. Thanks for the microwave tip, Caroline! Ha Ha, I’m the one laughing now, at myself. I’m 65, with severe rheumatoid arthritis, especially in my deformed hands, and up until now, I always cut my squash and pumpkins in half and baked them in the oven. I guess you can teach an old dog new tricks. This easy method will be so helpful for me now and in the future. I love reading your blog Maria, you’ve been so helpful to me with so many things you have written about (The spirilizer with my bad hands was my best investment ever! ), you are so inspiring with all you have going on in your life. I started Dr. Fuhrman’s diet this past December, after suffering with RA since I was 24. At the time, I was on prescription anti-inflammatory drugs and two chemo drugs, methotrexate weekly and two, four hour infusions of Rituxan every six months. Two months into his diet, I was off all my medications. I feel like I have been reborn, with so much energy. Welcome, Donna, thanks for this wonderful comment, and for sharing your fantastic improvements since you went plant-based Dr. Fuhrman style–I am so happy for you!! And really glad I made you laugh at yourself–I laughed at us too, all over again, reading what you wrote and identifying with it. So happy, too, that you love reading my blog. You made my evening!! 🙂 Keep on with your wonderful healing journey. I’ve been along on your ride for awhile now Maria, just never write comments. You’ve been a real motivation and inspiration for me since I first read your blog and life story. It’s not an easy diet to switch to when everyone around you is eating differently. Reading how plant based foods has helped you and feeling as good as I do now has kept me on track. Most people want to lose weight, that wasn’t my problem, I weigh 114 lbs. You were the first blog, from someone who had similar medical conditions like mine, who plant based foods helped. I thought I was a healthy eater before, no sugar and only ate salmon, fruits and vegetables, with occasional pasta and pizza but I guess I was wrong. Anyway, continued success with your healing as we continue on our journeys together. Looking forward to many more of your writings and magnificent art work.. Thanks so much, Donna, for this lovely comment. It means a lot to me to know that my blog has been a motivation and inspiration for you. I can relate to what you say about how you used to eat and how you thought it was healthy. That’s pretty much the way I used to eat, too, and everyone was always telling me I was the healthiest eater they knew. Apparently not healthy enough, though!! So yes, continued success to both of us on this journey together–so happy you enjoy the writings and the artwork!! A lovely way to cook squash without the bother. I have found that it doesn’t work with delicata, though. By the time I got the seeds scraped out, there was nothing left of the squash. Good chicken food! Thanks, Ruth, and welcome! Appreciate your tip about the microwave. I don’t own one, but others here reading along who do will want to know. I love the simple pleasure of oven roasted squash. It need not be fancy or complicated to be delicious. Hi Maria–this is genius! My husband and I love winter squash (especially butternut and pumpkin), and this has to be the easiest cooking method of all time. Can’t wait to try it! Maria – agree about you being an inspiration. On your little fruit cobbler with the long name, I kept thinking “free world” and smiling. We have choices about how we view everything including those things over which we have no other control. 🙂 A different way of eating is a challenge but the benefits are large. My list of “free” is also pretty long but I am starting to have a “bring it on” attitude. Thanks so much Sally! Free World indeed! 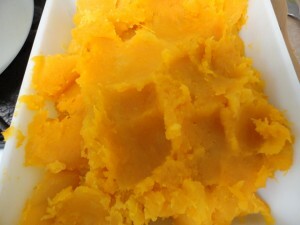 As you may know,I actually have a post from last Fall called Pumpkin Pie in the Free World with my recipe for pumpkin pie https://fatfreevegan.com/slowmiracle/2012/11/18/pumpkin-pie-in-the-free-world/, so your comment made me smile all the more. I am happy to hear you are cultivating a “bring it on” attitude. And I completely agree with you that while eating a different way is a challenge, the benefits are large. All the best to you. Thanks Ellen–LOL right back with you! !